I’m a Maryland girl. You know how you can tell? In my purse, I carry a container of Old Bay Seasoning (available from fine grocers as well as Amazon.com and Amazon.co.uk ). Except for when my purse is too small but usually that’s when I am going out in a dress and I try not to bring my own condiments and spices on those occasions. But, most days, my purse is perfectly-sized and there is a bit of Old Bay at the ready. I also have a tin of it by the stove at home. The other night, I was tired and didn’t want to do much cooking so my husband suggested I do something with the Old Bay (I didn’t marry a Maryland boy so it makes me very happy that he likes Old Bay). The dinner that resulted was easy and delicious! The recipe is super super simple. If you can cook chicken, you can make this. In fact, forget the recipe. I’ll just tell you in three sentences how to make Old Bay Chicken. Ready? 1. 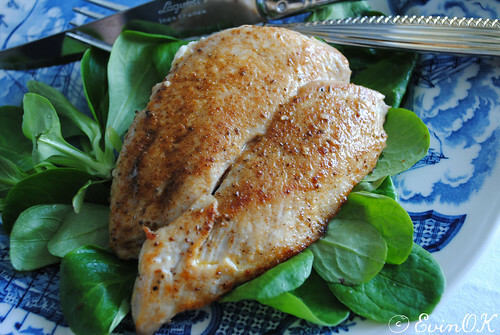 Sprinkle Old Bay Seasoning on both sides of a boneless skinless raw chicken breast. 2. Warm oil or butter in pan over medium-high heat and put breasts in to cook, turning once the edges appear cooked. 3. Check internal temperature of chicken breasts and serve once it is 165° or above. Not quite Maryland. 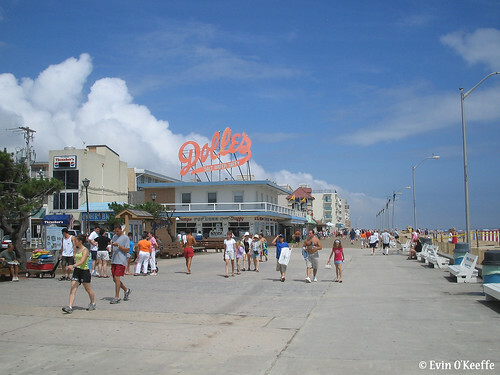 Here’s a view of the boardwalk in Bethany Beach, Delaware. Dolles has salt water taffy. Yum!